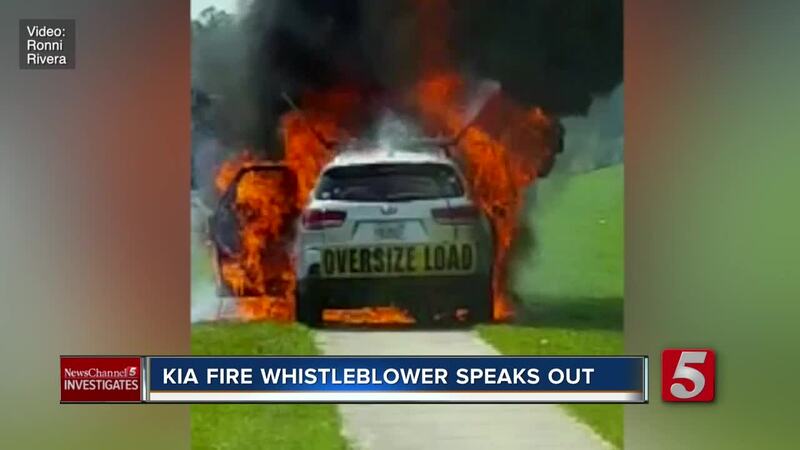 A week after automaker Kia announced a massive recall due to cars suddenly bursting into flames, a former Kia employee comes forward, claiming he'd warned the company more than a year ago about the problems and a possible cause, but says he was ignored. NASHVILLE, Tenn. (WTVF) — Last week, automaker Kia announced a massive recall after hundreds of Kia owners reported their cars suddenly bursting into flames. You may remember Metro councilman Jonathan Hall told us recently how that same thing happened to him. Now, a whistleblower has come forward saying he'd warned the company more than a year ago about the problem and what might be causing it. But, he says his warnings were ignored. "I am coming forward because people's lives are at risk," Jason Vaughn explained. He worked in Kia's Warranty Department at the company's headquarters in Irvine, California. "I discovered in the course of performing dealer audits a safety concern that I believe is causing the Kia vehicle fires," Vaughn said. In 2017, Vaughn said he found Kia dealers were fixing engine recalls improperly, leading to dangerous fuel pump leaks. "It's like hitting the car with a flame thrower," he said. Back in October, Metro Councilman Jonathan Hall told us how he had been on Clarksville Highway when his Kia suddenly caught on fire. "You just heard boom and I looked back and it's just a ball of flames," Hall described. Showing us video he'd taken of the fire, Hall said, "This is just seconds as I got out." And Hall's not the only one. Our sister station in Tampa found hundreds of similar Kia and Hyundai car fires. In fact, the consumer watchdog group, Center for Auto Safety, says drivers in 44 states have reported 276 Kia and Hyundai fires. Vaughn said he warned Kia corporate executives that he suspected faulty recall work was causing many of these fires. "I brought it up in a warranty operations meeting and there were six other people plus myself in the room. The warranty operation manager was not receptive at all. She didn't think it was something we should look at," he recalled. Chris Wolfe is thankful her two young children weren't with her when her 2012 Sorento burst into flames last month in Florida. "It was very fast, very fast," she said, describing the fire. And as she shared what was left behind, Wolfe said, "The seat is totally melted. That's the booster seat. That's where the 7 year old would have been sitting. " But here's the thing, Wolfe said she never had the engine work that Vaughn suspects is to blame in these fires. And neither did Jonathan Hall. That means botched recall work may not have caused all of the fires. "This needs federal attention," he said. Vaughn no longer works for Kia. He said he was pushed out last month after sounding the alarm. "There's never been in my 25 years in the industry has there ever been a situation this dangerous," Vaughn stated. The U.S. Attorney's Office in New York City is now reportedly looking into whether Kia and Hyundai, which are owned by the same company, handled these recalls properly. Meanwhile, they now plan to recall more than 150,000 cars and SUVs for fuel pump issues. They're not admitting this is what has caused any of the fires. They say it's merely a safety precaution. Right now, the recall covers certain Optimas, Sorentos and Sportage models. But consumer watchdogs are pushing for the recall to be expanded to cover more vehicles.